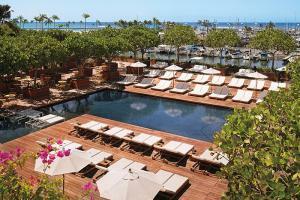 The MODERN Honolulu is a stunning new urban resort. Luxe, yet simple and modern, The MODERN Honolulu combines for the very first time great design with personal, friendly service and one-of-a-kind food, beverage and entertainment offerings - all under one roof. The MODERN Honolulu is set in its own private oasis, within walking distance to Waikiki's celebrated surfer's beach, marina and world-class shopping district. The hotel offers a restaurant by world renowned chef, Morimoto, an exclusive nightclub, a Sunrise Pool and a Sunset Pool, a unique outdoor oasis with a recreated sandy beach.